Help Support Ashland Youth Collective Youth: The Pomomusings Bump! 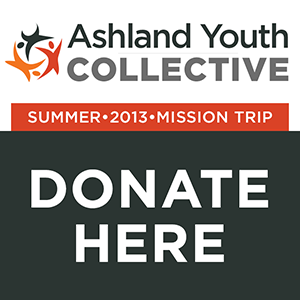 Our kids from the Ashland Youth Collective have just started the joyous task of fundraising for our 2013 Summer Mission Trip. I’ve written about our experiment with this collaborative form of youth ministry before here, and it’s continued to be an exciting part of my ministry here in Ashland. So, I decided I’d try and help them out with the Pomomusings Bump. You’ve probably heard of the Colbert Bump, right? Well, this is like that, it’s just the Pomomusings Bump. At any rate, with the stats that I have on Pomomusings, I know that I get around 500-800 visits to this site each day – which is awesome. Now, each student has to raise about $225 to go on this trip. So, if each of you visiting were to give just $1, that would help AT LEAST 2 kids go on this trip, maybe up to 3 or 4. And that would be a huge gift to this ministry that we have. So, that’s all I’m asking for. $1. And we’ve setup a PayPal donation link where you can do that $1 donation SUPER quick. So, could you take 2 minutes and give a donation to our summer mission trip? It’d be awesome if you’d be willing to do that.